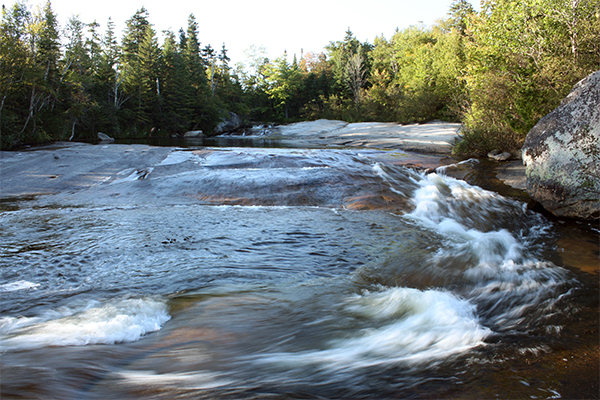 Ledge Falls is a series of natural waterslides deep within Baxter State Park. It is one of the highlights of a driving tour of the main park road. Expect some company here, especially in the form of children, inflatable pool toys and inner tubes. You won't find much in the form of waterfalls per se: rapids, slides and mini-cascades are what you can anticipate. The tallest drop is a 4-foot cascade, so this you won't want to hold a waterfall photograph seminar here. Below this cascade is a swimming and splashing playground, and it is one of New England's best for people seeking this type of place. Currents can be strong here, so many of the small pools and slides can be unfriendly (or outright dangerous) during high water conditions. The falls are clearly visible from the park road. The parking area is a 100 feet of so south of the falls. From Banger, take I-95 north to exit 244. Take a left onto ME 157, traveling west towards Millinocket. Continue traveling on ME 157 west into the center of the town of Millinocket. Just past where ME 157 ends in the town of Millinocket where ME 11 comes in from the south, take a right onto Millinocket Ave (sometimes called Katahdin Ave or Baxter Park Rd) while following signs towards Baxter State Park. To enter the park, you must pay a fee if you are an out-of-state resident (the park is free for Maine residents) and inform the gate keeper of your intentions to visit the falls (and whatever else within the park you'd like to visit). Ledge Falls is located on the west side of the main Baxter State Park road. To get there, take a left after checking in with the ranger at the entrance gate of the park. There is a parking area designated for the falls, and it is located 7.3 miles west of the Katahdin Stream campground along the park road. Parking is an issue here. Once the parking lot for the falls fills-up, you won't be able to stop at the falls. There is no overflow parking allowed, so on beautiful summer weekends you will want to visit early or late in the day for the highest chance of snagging a spot. The rangers of this park are very inflexible in the park because they follow a special set of guidelines set by the founder of Baxter State Park. These guidelines have helped keep the park in outstanding condition.